At the Sony press conference held in advance of IFA’s official opening on Wednesday, September 3, Kazuo Hirai, President and CEO, Sony Corporation outlined Sony’s latest developments in the areas of Mobile, Digital Imaging, Game and Network Services. “Each of our latest Sony products seeks to do more than just deliver new functionality, but actually change the way you interact with technology, and the way it integrates into your life. We seek not only to meet your needs, but through our Kando-inspiring technologies move you emotionally, and elevate your experience to new heights,” said Hirai. During the press conference Hirai also unveiled “Life Space UX” for the first time in Europe. An entirely new approach to the user experience and product creation, Life Space UX leverages the user’s surroundings and living space to enable content to be enjoyed more naturally and in entirely new ways. At IFA Sony is showcasing the evolution of the concept from its first unveiling at the International Consumer Electronics Show held in the U.S. this past January. Masaru Tamagawa, President, Sony Europe then unveiled Sony’s latest product lineup for Europe, presenting a 4K BRAVIATM model featuring a curved display screen, portable products such as its high resolution audio Walkman®, and lens styles cameras incorporating large sized image sensors. Kunimasa Suzuki, President and CEO, Sony Mobile Communications demonstrated how Sony is bringing together the best of its technologies in its mobile product lineup, led by the “XperiaTM Z3” which connects to PlayStation®4(PS4™) through PlayStation®App or PS4 Remote Play application. Suzuki also announced Sony’s latest SmartWear products, that integrate with its mobile products to allow users to record their daily activities and enrich their lifestyles. Xperia Z3 Compact is perfect for one-handed use with a rounded liquid reflection frame and tempered glass panels for an elegant premium finish, and measures just 129g in weight. It is also dust-tight and waterproof (IP65/IP68)*2. It is available in a range of four colors: white, black, orange and green. 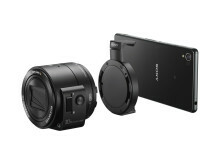 Both models leverage Sony’s advanced camera technologies such as its 1/2.3” Exmor™ RS for mobile CMOS image sensor, BIONZ™ for mobile processing engine and the new 25mm wide-angle Sony G-Lens, that combine to generate photos and videos in sharp and vivid detail. 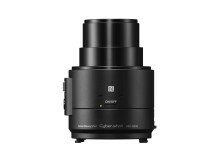 ISO 12800 sensitivity and Sony’s enhanced SteadyShot™ technology minimize noise and blurring, while delivering enhanced exposure and brilliantly vivid colors. Sony is also enabling users to enjoy the immersive PS4 gaming experience on the screens of their Xperia smartphones by expanding PS4 Remote Play. Xperia Z3 and Xperia Z3 Compact are scheduled for launch in Japan and other regions this Autumn. Xperia Z3 Tablet Compact is the world’s first tablet to offer PS4 Remote Play*1, enabling users to enjoy the PS4 gaming experience on its large, 8 inch screen. The TRILUMINOS™ display for mobile with Live Color LED provides a wide palette of rich natural colors for the sharpest images, and a viewing experience full of depth and reality when playing games or watching movies. *1: Functionality available on Xperia Z3, Xperia Z3 Compact and Xperia Z3 Tablet Compact starting from November 2014. PS4 System, DUALSHOCK®4　Wireless Controller, Sony Entertainment Network and high speed internet connection required. Some games may not support this feature. Latest version of PS4 System Software Update required. PS4 Remote Play Application required on Xperia. *2: In compliance with IP65 and IP68, the Xperia Z3,Xperia Z3 Compact and Xperia Z3 Tablet Compact are protected against the ingress of dust and are waterproof. Provided that all ports and covers are firmly closed, they are (i) dust tight and (ii) protected against low pressure jets of water from all practicable directions in compliance with IP65; and/or (iii) can be kept under 1.5 m of fresh water for up to 30 minutes in compliance with IP68. *5: Based on Sony analysis. When using noise-cancelling headset MDR-NC31EM, or MDR-NC31, MDR-NC033, MDR-NWNC33, MDR-NWN33S headphones sold from October 2009 for use with Walkman®. Ambient noise is not completely eliminated. Xperia E3 shares the same premium design style as Sony’s latest flagship Xperia Z3 series and is available in a range of striking colors including white, black, lime and copper*. Designed to fit firmly into the user’s hand, and featuring a scratch-resistant 4.5 inch screen, Xperia E3 is made to handle everyday wear, and keep it looking smart for longer. 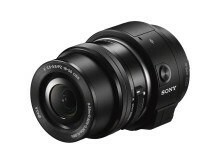 It is equipped with a 5 megapixel camera and Sony’s creative camera apps to add creative fun to photos and videos. Xperia E3’s ‘shake to start’ app enables users to customize shortcuts to their favorite apps and access them with just a flick of the wrist. Its high-speed Qualcomm Snapdragon™ 400 processor with quad-core 1.2GHz CPUs and long lasting battery with Battery STAMINA Mode keep users connected for longer, enabling them to enjoy entertainment on the go. *Colors may vary according to market. Sony is also launching new SmartWear products, which can be used in combination with compatible smartphones, tablets and dedicated applications to record users’ daily life data via "Lifelog". Using a variety of sensing technologies, Sony SmartWear products enable users to log both their motional activities, such as the number of steps they take, movements they make, and sleep patterns, as well as emotional activities such as pictures they take, music they listen to, calls, messages, and precious memories they’d like to remember. Lifelog app enables the user to visualize how they have spent the day and gain hints on how to further enrich their daily lives. With GPS and 4GB storage memory built in, SmartWatch 3 supports Android Wear by Google to not only deliver useful information and services based on the user’s latest activities, but also enable communication and entertainment including music to be enjoyed remotely, even when the user is away from their smartphone. Meanwhile, SmartBand Talk is equipped with a curved, always-on e-paper display, to enable hands free calls and voice commands. Its intuitive voice controls enable users to instantly check their Lifelog status with just a glance of their wrist. SmartWatch 3 and SmartBand Talk will be rolled out globally starting this Autumn. Going forward, Sony will further proliferate its range of SmartWear products, such as Smart Tennis Sensor*,which attaches to the base of the user’s tennis racket and visualizes every shot on their smartphone, and its prototype SmartEyeglass - transparent lens eyewear which superimposes useful information onto the user’s field of view. *Smart Tennis Sensor launched in Japan in May. It will be available from January 2015 in North America. 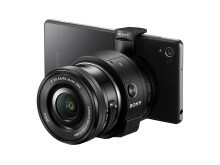 *Please refer to the following website<http://www.sonymobile.com/press&gt; for full Xperia product press releases. 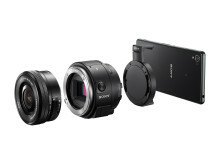 Sony is also expanding its Lens-style Camera lineup with two new models that link with smartphones*1 via Wi-Fi, and can be directly attached to smartphones or used separately to allow users to take pictures of themselves, or other high-quality photos and video*2 from any angle. ILCE-QX1 features the same APS-C CMOS image sensor as Sony’s mirrorless interchangeable-lens cameras, and is capable of taking high-quality photos with beautiful defocusing and clear night scene shots with high sensitivity and low noise, as well as a wide variety of expressions through its compatibility with interchangeable E-mount lenses based on the α™ Mount System. DSC-QX30 features the same 30x optical zoom Sony G Lens, Optical Steadyshot and auto-focus functions found in Sony’s Cyber-shotTM models, making it possible to capture photographs that could not be taken using just an internal smartphone camera, such as distant subjects, with less blur. 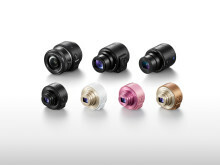 Additionally, copper and pink color variations have been added to the current DSC-QX10. Updates to Sony’s mobile application PlayMemories MobileTM have improved connection time and stability after connection, while also enhancing functionality and the user interface for easier operation. *1: Smartphone and tablet compatible with “Play Memories Mobile” is required. 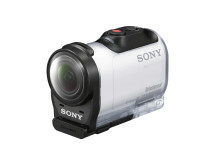 *2: A memory card is needed for recording certain types of footage such as video and continuous shooting. HDR-AZ1RV is a wearable camera which features a small and light body weighing approximately 63g, just two thirds the size of the current model, HDR-AS100V, thanks to the new Live-view Remote equipped with GPS recording function. 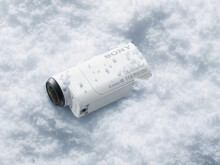 It can be easily attached to sports equipment such as bike handlebars and helmets, and with its 170° field of view*3 film stunning, high-quality footage of action sports such as skiing, snowboarding, mountain climbing, surfing and more. It can also be used for a range of other purposes, for example when travelling, for capturing family footage, or for filming hobbies. HDR-AZ1R is XAVC S(HD 50Mbps) compatible, enabling it to record high-quality video with less compression noise, even when shooting fast-moving scenes. 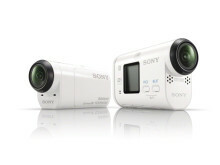 Furthermore, the new Live-View remote control is capable of playback*5 and deleting files stored on the camera. By using this model with the video-editing software Action Cam Movie Creator, users can also enjoy easy, high-grade video editing. *3: When SteadyShot is off. SteadyShot is only effective when filming with a 120° field of view. *4: Only video can be played back. Sound is unavailable. Sound Photo and Light Trail have been added to PlayMemories Camera Apps™, an application download service which allows users to add a variety of functions to their camera. ・Sound Photo: By recording sound before and after the shutter, Sound Photo allows users to relive the moment they experienced while taking a photo. This playback is not limited to cameras, but can also be played on PCs, mobile devices and TVs. ・Light Trail: Light Trail is an application which can reproduce light trails from the headlights of a car or fireworks in a single picture. This application makes it easy for users to produce photos which, in the past, could only be created using intricate, long exposure photography. Sony’s lineup of High-Resolution audio products take users beyond the level of CD quality, and Sony is continuing to expand its product lineup, primarily in the area of easily accessible, portable products. With Sony Music Entertainment (SME) also increasing the availability of Hi-Res audio content, the Sony Group is actively engaged in growing the Hi-Res market from both a hardware and content perspective. In terms of hardware, Sony is adding a total of 7 new products, including Walkman®, headphones and a portable amplifier, to its existing range of 32 Hi-Res audio compatible products*1. NWZ-A15 Walkman is the world’s smallest and lightest※2 Hi-Res compatible digital music player, and provides an easily accessible, high-quality listening experience. Sony is also introducing a total of three*1*3 new Hi-Res audio compatible headphones, for customers ranging from those looking to easily enjoy high-quality audio, to those passionate about the premium audio experience. Regarding content, SME has announced Hi-Res audio titles from popular artists including Pharrell Williams and Kasabian. Additionally, the Sony Group is strengthening its collaboration with a wide range of distributors to optimize the environment for enabling Hi-Res audio downloads. *1: Number of models introduced in Europe. Different to the number introduced worldwide. *2: As of September 3, 2014 local time. Dimensions: 43.6 x 109 x　8.7 mm (Width Length Thickness), Weight: approximately 66g. *3: Applicable products: MDR-Z7, MDR-1A, MDR-1ADAC. 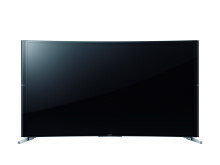 The S90B series (75/65), with its combination of curved LCD screen and powerful multi-angle live speaker system, is a new series of 4K Ultra HD BRAVIA® TV which offers an unparalleled level of emersion. 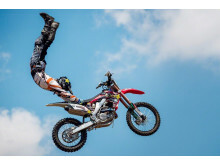 This series uses Sony’s unique 4K picture engine 4K X-Reality® PRO, X-tended Dynamic Range technology, and wide color gamut TRILUMINOS® Display as well as rich surround sound to provide the feeling of being at a movie theater, in the home. Sony is engaged in a range of initiatives to enhance the 4K viewing experience in the home, some together with service partners. Amazon will start providing Ultra HD content on Amazon Instant Video and Prime Instant Video this year, and 2014 4K BRAVIA models will be able to receive this service in the United States, United Kingdom and Germany. In terms of broadcasts, ASTRA is providing a 4K demo channel available via satellite on 19.2°East, and Sony is showcasing 4K BRAVIA receiving these signals on the Sony booth. *Announced on August 7, 2014. This series is planned to be sold in Europe and China from September. Sony announced Life Space UX, a new concept which utilizes space itself to generate experiences, at International CES in January, 2014 where it introduced its 4K Ultra Short Throw Projector*, which is scheduled to go on sale in the U.S. at the end of September, as well as a tabletop screen, ceiling screen and wall mount display concept models. At IFA 2014, Sony is showcasing its lineup of products that comprise Life Space UX, including concept models and development prototypes that incorporate new technologies, for the first time in Europe. These concept models include LED bulb speaker, a conventional sized light bulb which contains speakers and connects wirelessly with smartphones to transform the entire home into a musical space. Sony will also be exhibiting a compact, cube-shaped and waterproof portable ultra short throw projector which, when placed on a refrigerator door or even in a bathroom, can project an approximately 23 inch image capable of being manipulated by touch. “Sony”, “WALKMAN”, “Cyber-shot”, “Handycam”, “α”, “BRAVIA” and “Xperia” are registered trademarks or trademarks of Sony Corporation. All other trademarks or registered trademarks are the property of their respective owners.